Are you’re frustrated at not having the farm of your dreams? Fed up with being totally broke while other players are raking it in? Feel like Farmville is taking over your life? Then you’ve come to the right place. You want to become a Farmville Billionaire with tons of coins, mansions, and an amazing farm that will make your Farmville neighbors green with envy. Most Farmville players think the only way to do this is to sit around all day playing Farmville 24/7, well this is completely false in fact, all the top Farmville Superstars that put this program together only play for a few minutes each day and even miss a day here and there. The key to getting everything you want in Farmville is not to play for outrageous amounts of hours but to maximize your profits by using automation software. 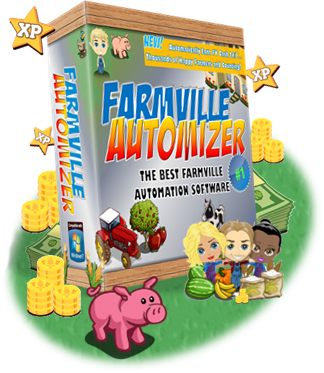 Farmville Automizer™ is the Next-Generation when it comes to FarmVille Automation Software - quite frankly, it's light-years ahead of the competition, nobody can even come close to it! As the most-up-to-date, effective, and all-inclusive FarmVille Automation tool in the world, it's no surprise that millions of Farmvillers such as yourself are clamoring to get their hands on this game changing software. Instant Download After Purchase. Even at 3am!! 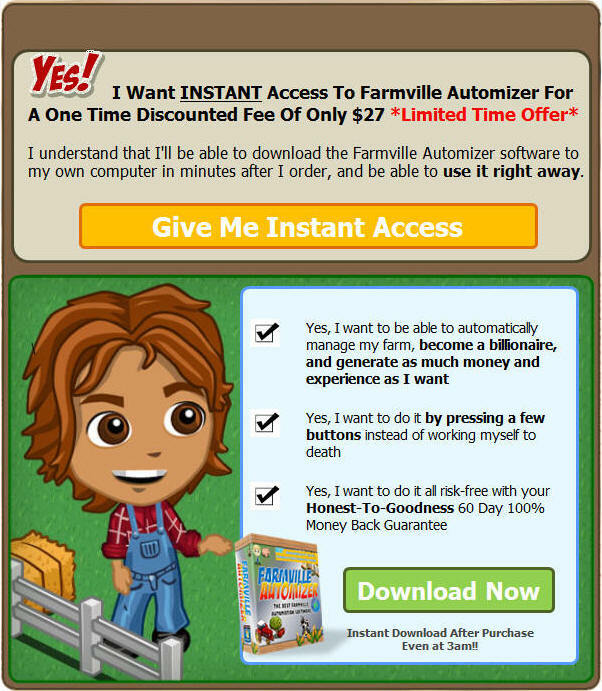 Installation Wizard: Installing Farmville Automizer has never been easier. The Automatic Installation Wizard does all the work. Manages Farm on Autopilot: Plant crops, harvest crops, plow, harvest trees, collect buildings, collect animals, help neighbors, complete missions, complete crafts and much more in just 1-CLICK. Powerful Plug-ins: In order to make the software timeless, we built in the ability to expand its capabilities through plug-ins. 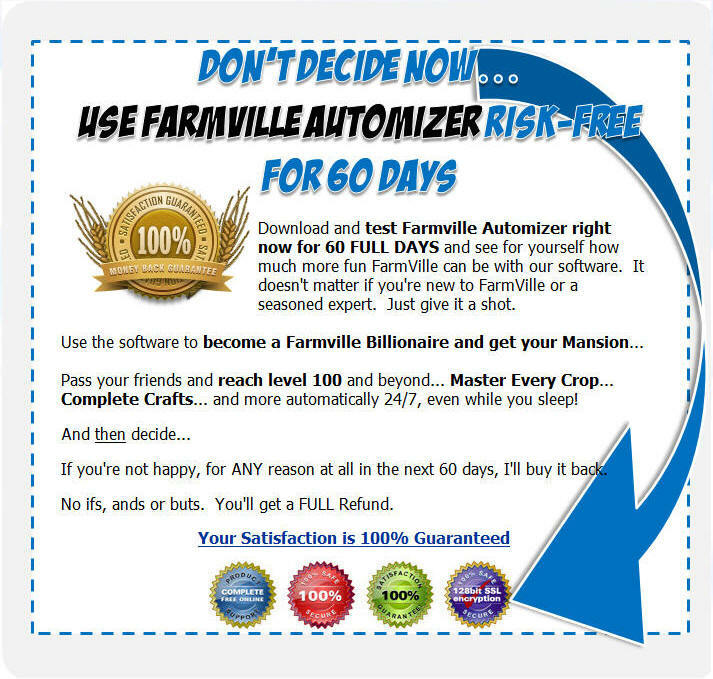 Free Updates: Farmville Automizer keeps users at the top of their game with frequent new releases with the latest strategies and protocols built in so that you never fall behind. Runs in Background: Farmville Automizer works in the background while its minimized to your taskbar so you can do other things like surf the web or check email. Facebook Compatible: Works on both Facebook.com and Farmville.com giving you the flexibility to choose where you want to play the game. Works Worldwide: Take a laptop, have an internet connection and you are ready to Farm Gold in any country. And the best part is YOU can have Farmville Automizer™ running on your computer 3 minutes from now! Real farmers invest in the latest technology so they can work less and make more money, and there is no reason the same shouldn't apply for Farmvillers. But none of them even come close to Farmville Automizer™! Master Crops - the software will automatically plow, plant, and harvest for you 24/7 so you can master every crop. Just tell it the type and number of seeds or other criteria such as profit per hour and it will keep track of everything so you can forget using crop timers ever again. Harvest Trees - harvest all your trees with a single click. It's like having an unlimited supply of arborists at your finger tips. Make Unlimited Coins - become a Farmville billionaire and never worry about having enough money again. Pimp out your farm with a mansion today. Level Up At Light Speed - the software will exchange coins for XP using a top secret technique that will have you flying past your neighbors like a shooting star. Craft Goods - automatically starts crafting new goods based on checked recipes and available bushels then finishes them when their complete so you can super-charge your farmer. Earn Achievements - automatically gain all the ribbons and achievements by accomplishing the most difficult Farmville feats that take thousands of hours to complete manually. Tool Box - an essential multi-function plugin that will help you in everyday farm life. Includes Animal Manager, Flower Manager, Farm Gold, and other useful applications that you shouldn't live without. FV Manager - allows you to sell/delete items from your farm. It also will clear plots. FV Manager also allows you to buy and place any legal item on your farm including buildings, trees, decorations etc. or a specific pattern of seeds is planted. This is ideal if you who want to plant different types of seeds or want to create a unique design on your farms. Gift Box Manager - will check your gift box when items are found and process them accordingly. It can add vehicle parts to vehicles in your garage, feed kibble to your puppies, use consumables, place animals on your farm and much more. Gift Net - (included free for a limited time) is a network that connects other users and allows them to automatically send gifts to each other so they can get the items they need. In addition, Gift Net is a great way to find new neighbors. Steal - will automatically click on gift links and other reward links so you can build up a stash of free loot. (It's not really stealing, it just feels that way because your getting free stuff.) Farm Info - a simple plugin that gives some information about your farm including crops mastered, ribbons achieved, number of animals on your farm, and more. Farm Map - generates a cool map of your farm with zoom-in ability so you see all your items and move, sell, and delete them fast. Neighbor Fertilizer - automatically fertilize the crops on your neighbors and your neighbors neighbors aka NNs farms. and Join the Club of Farmville Billionaires today! As you can see, it's as easy as 1-2-3! If you're worried about getting Farmville Automizer because you're a new player or you've had trouble installing software before, set your fears aside. Our software is installed using an Automatic Installation Wizard that does all the work for you. Now you have nothing to lose, but I know you feel crushed because you don't have Farmville Automizer yet. With our software tools, there's literally nothing standing between you and your perfect farm. All you have to do is launch our software and press a few buttons. We've made it affordable for anyone. Just the money you save by not paying Zynga for cash and FarmVille experts for "Secrets" will more than pay for Farmville Automizer within a couple weeks, not to mention the time you'll save from automating the repetitive and time consuming tasks of farming that can drive anyone crazy. There's no monthly fee — buy it once, use it forever. And we'll give you free lifetime updates! P.S. This software is only available for a limited time and is selling out as we speak. The only way to guarantee a slice of the action is to ORDER NOW. I cannot guarantee that this website will be here when you next return as I am taking it down as soon as the limited quantity of copies have been ordered. If you are able to view this page, there are still copies available. I can't tell you how many and I can't tell you how long the site will be up for. All I can guarantee is that if you order now, you will be well on the way to top of the farmville world by this time next week. P.P.S. Take the time consuming pain out of managing your farm yourself and save the time and money you'd usually need to spend mindlessly clicking and buying coins for cash. This brilliant software app will automatically manage your farm for you at the click of a few buttons, so you can finally start creating your perfect farm without the pain. Software Disclaimer: The software is distributed "as is" and with no warranties of any kind, whether express or implied, including and without limitation, any warranty of merchantability or fitness for a particular purpose. The user (you) must assume the entire risk of using the software. In no event shall any individual, company or organization involved in any way in the development, sale or distribution of this software be liable for any damages whatsoever relating to the use, misuse, or inability to use this software (including, without limitation, loss of information, or any other loss). The software will not run every aspect of the FarmVille game for you. Plugins may require additional customization or work. Some stated uses are conceptual and may require additional programming. Have fun and use it to your benefit. Our software is designed for Microsoft Windows computers. FarmVille® and Zynga® are all trademarks or registered trademarks of Zynga, Inc. in the United States and/or other countries. These terms and all related materials, logos, and images are copyright © Zynga, Inc. This site, guides, and/or software is in no way associated with, an affiliate of, or endorsed by Zynga, Inc.® All other trademarks are the property of their respective owners.